There’s a ton of food in HONK IF YOU HATE ME. The story is, after all, set in a town that owes its existence to the fast food industry, every other building has a drive-thru, the air reeks of French fry grease, and a mysterious, decade-long heat wave broils the town like a hamburger patty on the grill. But one of the most important foods in the book can’t be found in any fast food joint: Sweet and lovable Otter Pops. Like most kids, as a little girl I cried for my mommy when I was sick. She knew all the tricks . . . kiss a boo-boo, starve a cold, feed a fever, drink plenty of fluids, all the important stuff. And she knew that a key technique for pushing fluids on grumpy patients was offering them Otter Pops. I lunged greedily at them, every time. 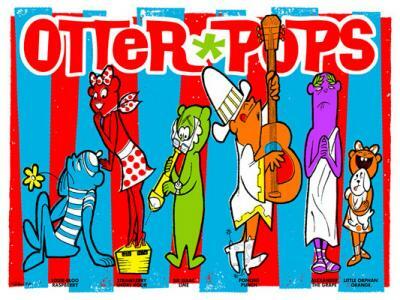 “Otter Pops!” They were tasty. They were colorful. They were my friends. Little Orphan Orange, Poncho Punch, Alexander the Grape, Louie-Bloo Raspberry, Sir Isaac Lime, Strawberry Short Kook. They cheered me up when I was down. I needed them as much as I needed Mommy’s hugs and words of comfort. Then I grew up and moved out. I’d graduated college, I was on my own, I was free. And, as I discovered the first time I got sick, I was also alone. Mommy was thirty miles from my sickbed, not thirty feet. It just wasn’t right. Who would hug me and tell me I’d be all right? Who would give up her sleep to hold me till I dozed off? Who would make everything better? I cried that night and turned to my colorful freezer friends for comfort. To this day, those cold pops warm my heart. That’s why the first time my triplets got sick, I rushed to buy them a box of Otter Pops. I was a mommy, and that was what mommies did, I knew. But on the way to the store, the doctor called. “Buy Pedialyte Freezer Pops instead. They have electrolytes.” Disappointed but determined to do the best for my babies, I bought the Pedialytes. 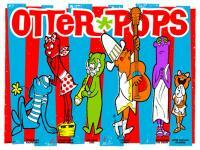 Like Otter Pops, they were long and skinny and colorful. But their wrappers were clear, personality-less. No Little Orphan Orange. No Sir Isaac Lime. No Poncho Punch. How could they be friends to my sick boys? How could they cheer my children when they were down? It just wasn’t right. I was almost happy when the boys rejected the inferior pops, in reality being too young for popsicles anyway. In Honk If You Hate Me, Otter Pops count among Mona’s comfort foods. They appear in scene 1, page 1, and have cameos throughout the book. At a key moment, Mona’s father offers her a Louis-Bloo. Her reaction to his offer is a meaningful moment in the story, just as these seemingly frivolous pops are meaningful things to me. Oddly, when I first wrote the pops into the story, I didn’t even realize what I was doing. They just showed up when I focused on a character in need of comfort. So it seems that Mona’s fascination with Otter Pops stems from my own history with them. And Mona’s thing against Louis-Bloo? Well, that’s all me, too. Raspberry-flavored food should never be blue. It’s just not right.